September 2015 saw the release of two papers detailing the taxonomy1, and geological and taphonomic2 context of a newly identified hominin species, Homo naledi - naledi meaning 'star' in Sesotho. Whilst the naming and description of a new part of our ancestral lineage has not been an especially rare event in recent years,3-7 the presentation of Homo naledi to the world is unique for two reasons. Firstly, the skeletal biology, which presents a complex mixture of primitive and derived traits, and, crucially, for which almost every part of the skeleton is represented - a first for an early hominin species. Secondly, and perhaps more importantly, this taxon provides evidence for ritualistic complex behaviour, involving the deliberate disposal of the dead. 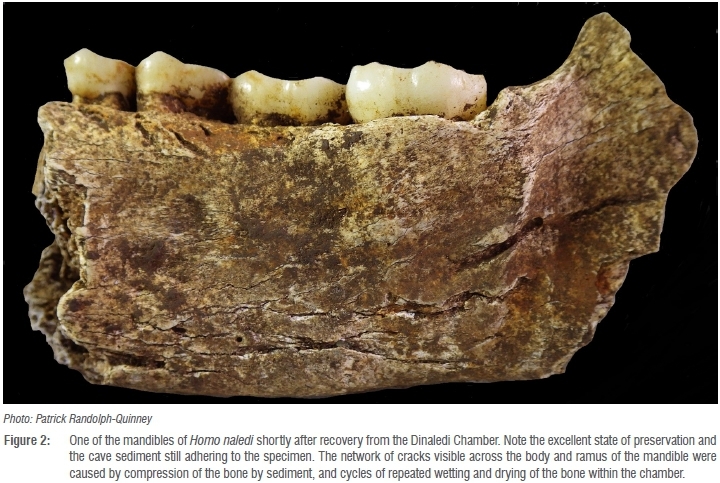 The initial discovery was made in September 2013 in a cave system known as Rising Star in the Cradle of Humankind World Heritage Site, some 50 km outside of Johannesburg. Whilst amateur cavers had been periodically visiting the chamber for a number of years, the 2013 incursion was the first to formally investigate the system for the fossil remains of early hominins. The exploration team comprised Wits University scientists and volunteer cavers, and was assembled by Lee Berger of the Evolutionary Studies Institute, who advocated that volunteer cavers would use their spelunking skills in the search for new hominin-bearing fossil sites within the Cradle of Humankind. Whilst most South African field palaeoanthropologists have at one time or another had cause to venture into the caves of the Cradle, very few have received the formal training that would allow them to climb, abseil or squeeze into the deepest, most dangerous cave environments; Berger's team is unique in that they willingly went into the dark spaces of the earth that the rest of us (or at least those of us with a healthy survival instinct) balk at. The investigation proved immediately fruitful in that undoubtedly hominin skeletal remains were recorded by the exploration team in a chamber some 30 m underground and 90 m from the cave entrance; the skeleton of a single individual was suspected, and lay exposed on the surface of soft unconsolidated sediments. Because of the sedimentary environment, recovery could proceed using methods more akin to bioarchaeology, rather than the traditional palaeontology of the Cradle in which fossils are entombed in calcified breccia. However, the structure of the cave was such that the fossil chamber (named Dinaledi Chamber) was only accessible by a near-vertical chute and crawl so narrow that only very small and slender individuals could access it. As such, a formal excavation and recovery effort was set up, involving the use of excavators who were physically suited to access the cave. The geology and context paper2 details the unique methods of the excavation strategy, in-situ recording, and recovery of the fossils, which include 'remote' field direction and 3D scanning of the excavations rather than using conventional archaeological survey equipment - limitations imposed by the inaccessibility and small size of the Dinaledi Chamber. 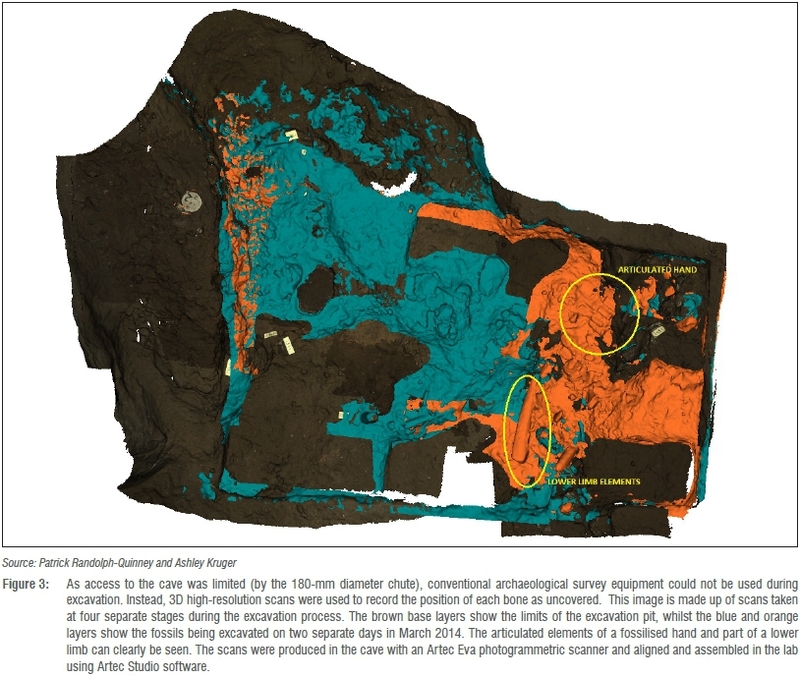 These imaginative strategies culminated in the Rising Star Expedition which during November 2013 and March 2014 recovered more than 1550 identifiable fossil elements; about 300 numbered bone specimens were collected from the surface of the Dinaledi Chamber and about 1250 numbered fossil specimens were recovered from a small excavation pit in the chamber (Figure 1). This discovery is the largest single fossil hominin assemblage found on the African continent to date. The fossils, which have yet to be radiometrically dated, were derived from at least 15 individuals, a total likely to represent a small fraction of the fossils remaining in the chamber and awaiting excavation. Through the course of a long and highly detailed paper, Berger and colleagues1 lay out the argument to place the Rising Star fossils into a new species, which whilst highly primitive in terms of cranial capacity and body proportions, still warrants inclusion in the genus Homo. The species is characterised by a body mass and stature similar to those of small-bodied human populations, with an average stature of approximately 1.5 m and an average body mass of about 45 kg (range 40-56 kg), but has a small endocranial volume (465-560 cc) similar to that found in Australopithecus. The teeth of H. naledi are generally small, with simple cusp morphology - traits shared with Homo habiils. The skull morphology of H. naledi is unique, but shares similarities to other early Homo species including H. erectus, H. habiiis and H. rudolfensis, and differs markedly from taxa such as Paranthropus and Australopithecus ghari through lack of cranial crests, and A. afarensis, A. afrícanus and A. sediba through (amongst others) the expression of sagittal keeling and an angular occipital torus, and in the brow region with a pronounced supraorbital torus with post-toral sulcus (a depression between the brow ridge and the rising frontal bone). The mandible is gracile, with a vertically oriented symphyseal region, overall more akin to early Homo than Paranthropus or Australopithecus. Postcranially H. naledi is a complex mixture of primitive and derived. The hands and feet are human-like in their functional morphology, although H. naledi has extremely curved fingers. The hand morphology suggests the capacity for tool-using capabilities, whilst the curvature demonstrates climbing capability; together a fascinating combination. The human-like hands and feet are contrasted in the postcranial skeleton with a more primitive or australopith-like thorax, shoulder, pelvis and proximal femur. No phylogenetic analysis is presented in the paper - and I eagerly await analyses which incorporate both the cranial and the postcranial skeleton. It will be interesting to see how such an organism aligns phylogenetically with the current record given the combination of derived features of the cranium (bar cranial capacity), the human-like hand and foot, and such a primitive shoulder, thorax and pelvis. In retrospect, what is perhaps most striking about the analyses presented is that H. naledi as a species is defined on an entire corpus of skeletal material, with almost every single element of the body represented multiple times, across multiple individuals of differing biological ages, and which overall displays limited variability in morphology across the species range for any element. The range of variation and taphonomic associations preclude this material being a commingled assemblage made up of multiple taxa. This situation is in opposition to the usual situation which bedevils palaeoanthropology, in which a taxon is narrowly defined on the basis of a single jaw or skull, or through contextually unassociated specimens, because of the vagaries of fossil preservation and recovery. 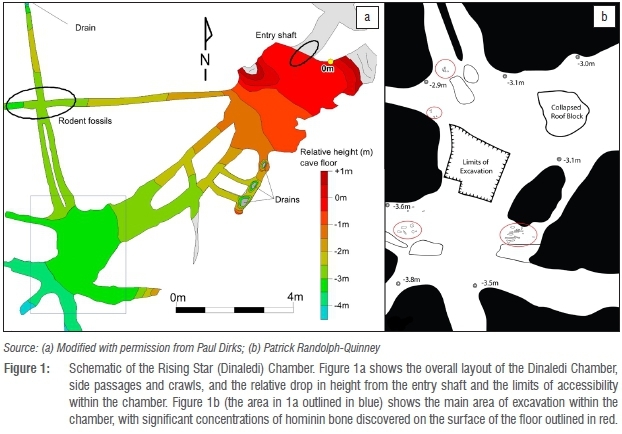 Whilst the skeletal morphology represents a new and complex suite of evolutionary characteristics, the geological context of the chamber also presents an anomalous depositional environment in comparison to the 'classic' sites of the Cradle of Humankind in Gauteng - Sterkfontein, Kromdraai and Swartkrans. The latter sites are noted for fossil remains contained in lithified breccia or found in decalcified sedimentary units derived ultimately from clastic breccia.8-13 The Dinaledi Chamber is unique in that the fossils were recovered from soft unconsolidated sediments within the karstic system, and appear never to have been breccified during their depositional history (Figure 2). The primary cave structure and stratigraphy were studied in the main by Dirks, Roberts and Kramer.2 They identified a basic stratigraphic development of two facies (Facies 1 and 2, with 1 being the oldest) subdivided into three stratigraphic Units (1-3, from old to young). Unit 1 represents the remnants of laminated mudstones preserved as erosion remnants within the chamber. Unit 2 is a composite unit that consists of remnant outcrops of variably consolidated sediments which contains several hominin bones, including the shafts of a juvenile hominin ulna and radius. Unit 3 is the youngest stratigraphic unit, and is represented by sediment that accumulated along the floor of the chamber and is composed of largely unconsolidated sediment derived from weathering and erosion of Units 1 and 2. The majority of the hominin bones was derived from Unit 3. Dirks' geology team have demonstrated that the clay-rich sediments making up the units were derived from in-situ weathering, and from exogenous clays and silts, which entered the chamber through fractures that prevented passage of coarser-grained materials; thus the infill of the Dinaledi Chamber is the end product of a series of filters or traps, which winnowed out all large-grained sediments or clastic material, en route to final deposition within the chamber. This winnowing process did not include the hominin fossil material, which must therefore have been transported into the chamber by a mechanism other than sedimentary accumulation processes. This brings us to the taphonomy of the assemblage (undertaken by Backwell, Musiba, Roberts and myself), the signatures of which represent a unique situation compared to other South African early hominin-bearing karstic cave sites for three main reasons. Firstly, the hominin remains are numerous and concentrated into a very small area (the main bone-bearing section of the chamber is only 4 m2). Secondly, with the exception of a small number of recent intrusive rodent and bird bones, the only bones contained within the chamber are hominin. And thirdly, the assemblage is unique by what it does not evidence, in that it presents no evidence of perimortem breakage or trauma, no carnivore modifications (puncture marks, gnawing, etc. ), no cut marks, no sub-aerial exposure or weathering, no evidence of water transportation, and no evidence of burning or charring. The assemblage was not carried in by carnivores, transported by water or mudflow, was not exposed to the elements on the land surface before being brought into the cave, and shows no evidence of the individuals having fallen into a death trap. What it does evidence is: (1) partial or near-complete articulation of anatomical elements which usually disassociate early in the decomposition sequence, such as hands and feet (Figure 3); (2) the presence of bone elements usually and easily lost to winnowing; (3) extensive modification of the surfaces of the bones by invertebrates (possibly snails or beetles); and (4) mineral staining and patterns of fracturing and cracking arising as a result of fluctuations in soil moisture content and changing water levels in the Dinaledi Chamber over time. Taken together, this presents a formational process unlike any other fossil assemblage identified to date within the Cradle. Many of these sites represent natural death traps, or bone dens of carnivores, where hominin fossils are accumulated along with the remains of other animals that inhabited the landscape of South Africa. Dirks and his team attest that unlike other southern African cave sites in which hidden shafts and sinkholes provide access from the surface to the cave, there is no indication that a direct vertical passageway from the surface into the Dinaledi Chamber ever existed, with reconstructions of the cave environment indicating that reaching even the entrance of the Dinaledi Chamber would always have been a difficult obstacle course, particularly in the absence of artificial light. Dinaledi is unique in that only hominins are represented, and the skeletons show no evidence of transportation into the cave by the usual suspects (gravity, carnivores or flowing water) which represents a depositional scenario that deviates from all other hominin localities in the region.14-16 Ruling out possibilities such as hominin occupation, water transport from the surface into the chamber, accumulations by predators such as hyaenas or leopards, or a mass fatality situation such as a death trap or fall, the authors are left to conclude that the fossil assemblage was produced by the hominins themselves - by the deliberate disposal of the dead. In this scenario, bodies of the individuals found in the cave would either been carried into the chamber or dropped through an entrance similar to, if not the same as, the one presently used to enter the Dinaledi Chamber. It is important to stress that nowhere in the paper is it suggested that deliberate burial is being practised. Disposal is not the same as burial, and may be purely functional as a mechanism of, say, predator avoidance, or may carry some deeper significance in terms of the primate grief response. Given the primitive morphology and small brain size of this hominin, and the current lack of a date for the species, this interpretation raises a remarkable series of questions and 'what ifs'. After all, body disposal is a behaviour previously thought to be unique to humans or near-humans17 - the possibility of a form of ritualised behaviour (in this context, 'ritualised' refers to a repeated or habituated pattern of behaviour rather than the notion of symbolic thought) in such a primitive-looking species such as H. naledi is bound to meet with resistance. Whilst body disposal by hominins is known from sites in the Middle and Upper Pleistocene such as Atapuerca Sima de los Huesos and many Neanderthal sites, these behaviours are ostensibly practised by hominins with a relatively large brain, which look relatively 'human', and which display other archaeological aspects of complex cognitive behaviours.18-25 The situation is compounded by the fact that H. naledi remains, as yet, undated. If the species turns out to be Plio-Pleistocene in date, perhaps in the order of 2 Mya, it would represent the earliest appearance of Homo that is based on more than just isolated fragments of bone, together with the early adoption of ritualised behaviour coupled with primitive morphology. On the other hand, if H. naledi is young, less than 1 Mya, it would demonstrate that several different types of ancient humans coexisted at a similar time in southern Africa, including an especially small-brained form like H. naledi. Given its primitive skeletal adaptations, this might have profound implications for the production of the African archaeological record. It would also have profound implications for our understanding of the origins of complex behaviours previously thought to arise only with the origins of hominins biologically and archaeologically similar to our own species. Resolution will require firm dates, and I think willingness for archaeologists and palaeoanthropologists to throw out historical notions of cognitive evolution proceeding hand in hand with derived biological morphology. As a footnote, the Rising Star Expedition is perhaps the first early hominin project to have been open to public scrutiny from excavation to analysis through the avenues of social media and the Internet. Throughout the excavation, the team shared expedition progress with a large public audience, from schoolchildren to fellow scientists, through blogs and video diaries, and the (often terrifying) immediacy of Twitter and Facebook; the strategy behind this approach was developed and implemented by Hawks in conjunction with Berger. This public and intellectual openness extended to the analysis phase, where the fossils were studied in a unique workshop in May 2014 funded by the South African DST/NRF, Wits University and National Geographic. More than 50 experienced scientists and early-career researchers came together over the space of a month to analyse the fossils and begin reporting on them. As a consequence, H. naledi progressed from first discovery to scientific dissemination in under 2 years, an almost unheard of feat in South Africa, where hominin fossils can remain undescribed and unpublished for decades. We eagerly await (presumably) forthcoming individual papers on the discrete anatomical regions of the H. naledi skeleton, and analyses of sexual dimorphism, growth and development, and the phylogenetic relationship between H. naledi and other hominin taxa. Patrick Randolph-Quinney is a forensic anthropologist and taphonomist and is one of the co-authors of the Dinaledi context paper, in which he contributed to the excavation and body recovery protocols, and analyses of weathering, skeletal damage patterns and other taphonomic processes in the deposition and formation of the assemblage.